This shot, designed specifically for waterfowl, has an innovative hex shot design with a diamond cut wad. This wad provides consistent shot spread, and when combined with the correct choke will result in superior performance. These shot shells give a waterfowl hunter an added advantage with its hex shapes shot, which allows more shot in the same shell. Because this cube shaped shot imparts its kinetic energy on the target faster than regular shot, it is inherently more lethal. 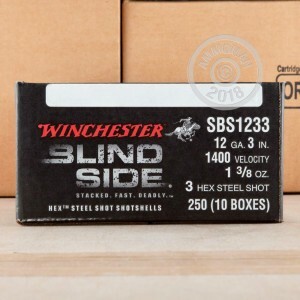 This ammo is lead-free, and can be used in any state or hunting area with lead ammunition restrictions. 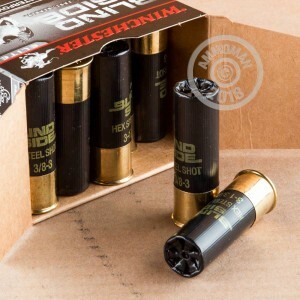 For over 100 years, Winchester has produced quality ammunition of U.S. citizens and the U.S. military. Winchester continues that tradition today by producing the same quality ammo, with innovative new products that are design to out-perform anything else on the market. 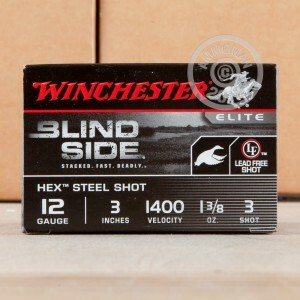 Order a box of this ammo today, and you will see why Winchester is a staple of the shooting community.